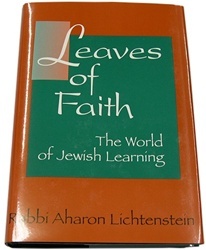 Volume I deals, primarily, with various aspects of traditional Torah learning. The opening chapter focuses upon the rationale and religious significance of the study of gemara in particular, with an eye to the place which presumably obtuse texts have remarkably held in many strata of the traditional Jewish community. This is followed by two essays which analyze the character and methodology of serious talmud Torah. Subsequently, the focus shifts to the interaction between Torah study, narrowly defined, and related areas – whether general culture, or national service – which impinge upon the personal and institutional context of Torah study. In a similar vein, two chapters then treat at the world of Halakhic decision, with reference to both the qualities requisite for the decisor – posek and the factors which legitimately affect the process of posek. The volume concentrates concludes with appreciative portraits of two masters greatly admired by the author, each of which, in very different ways, exerted a major impact upon him: Rav Joseph B. Soloveitchik and Rav Shlomo Zalman Auerbach. Volume 2 relates to elements of personal, communal, and national Jewish life. Where its predecessor dwelt primarily upon the content, mode, and practitioners of Torah study, this volume focuses upon issues – some theoretical, others pragmatic; some current, others timeless – which concern the practice and implementation of Torah. A number of essays deal with aspects of Halakhah – whether its relation to an independent ethic, in general, or the substantive content of specific issues, in particular: Shabbat prayer, shemittah, conversion, or abortion. Several focus upon the Israeli scene, specifically. These range from analyses of the interaction of religion and state or the concept of Jewish fraternity to more narrowly based discussions of the Chief Rabbinate or Baruch Goldstein. Other essays are concerned with the structure and character of the contemporary Jewish community: self-identification, the role of communal service in advancing Jewish values, and the place of modernity within current Orthodoxy. At another plane, two essays address more personal and perennial issues: the parameters of tolerance and spiritual response to suffering. The volume concludes with a series of responses to major questions posed in various symposia, in which participants were asked, descriptively and prescriptively, both to evaluate the current Jewish scene and to chart a suggested course for its future direction. 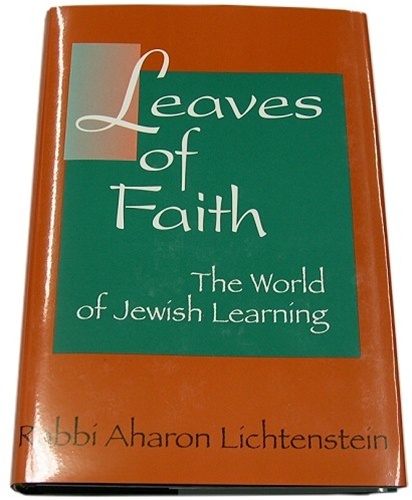 Volume 1 deals with various aspects of traditional Torah learning. The opening chapter focuses upon the rationale and religious significance of the study of Talmud. This is followed by two essays which analyze the character and methodology of serious Torah study. Subsequently, the focus shifts to the interaction between Torah study, narrowly defined, and related areas – whether general culture, or national service – which impinge upon the personal and institutional context of Torah study. In a similar vein, two chapters then treat at the world of halakhic decision, with reference to both the qualities requisite for the decisor and the human and social factors which legitimately affect the process of halakhic decision-making. The volume concludes with appreciative portraits of two masters greatly admired by the author, each of whom, in very different ways, exerted a major impact upon him: Rav Joseph B. Soloveitchik zt"l and Rav Shlomo Zalman Auerbach zt"l.